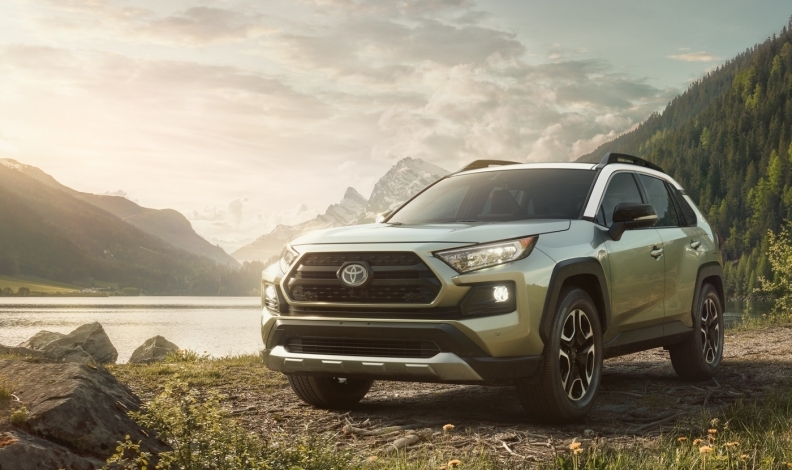 The hybrid version of the 2019 Toyota RAV4, above, will be assembled in Ontario. Toyota Motor Corp. will spend $1.4 billion upgrading two of its three Ontario assembly plants in order to build the next generation of the RAV4 crossover vehicles, with about $200 million of that coming from two levels of government. The Canadian and Ontario governments will each provide up to $110 million toward the projects. The provincial money is part of a conditional grant. Prime Minister Justin Trudeau and Premier Kathleen Wynne made the funding announcement at the Toyota Motor Manufacturing Canada (TMMC) North Plant in Cambridge, Ont. on Friday afternoon. “It’s such good news, I’ll repeat it in French,” Trudeau said after announcing the federal contribution in English. The upgrades, which include new automation technology in the paint and plastics departments, are to be completed by 2019. The investment will retain 8,000 jobs and create an additional 450 jobs and 1,000 co-op placements. Trudeau said the Toyota investment will solidify a supply chain of 60-plus Canadian companies. “This is a great day for the auto sector,” Trudeau said. Toyota has been assembling the RAV4 in Woodstock, Ont., since 2008. The automaker has long planned to also build the popular vehicle at one of two plants in Cambridge, Ont., once it moved production of the Corolla out of Canada. The Corolla will now be built at a new Toyota-Mazda Motor Corp. joint venture under construction in Alabama. Toyota said in March at the New York Auto Show that it will build the hybrid version of its all-new 2019 RAV4 at a plant in Ontario. At the moment, all hybrid models are built in Japan. Only conventionally-powered RAV4s are built in Woodstock. The RAV4 compact SUV is Toyota’s best-selling vehicle in Canada, with sales of more than 50,000 nationwide last year. About one in four of those vehicles was a hybrid. In the United States in 2017, the RAV4 was the best-selling vehicle that is not a pickup truck, with sales of more than 400,000. The all-new fifth generation RAV4 will be delivered to dealer lots in Canada at the end of this year, probably in December. The hybrid will be available soon after, the company said in March. With files from Laurence Iliff of Automotive News and previous files from Mark Richardson of Automotive News Canada.